Little Roses: Home Made Chocolate: A perfect birthday present! It’s a perfect birthday present for your loved ones! We got a called yesterday from a girl from Kajang who wants Little Roses Chocolate to give as a present to her boyfriend on his birthday (which is today!). She told us that her budget is around RM50 for the chocolates plus decoration. And finally, we came up with this idea (refer the pictures) and guess what? The total cost that we were charging her is lower than what she'd expected. It only cost her RM45 including the delivery charge. Reasonable price isn't it? 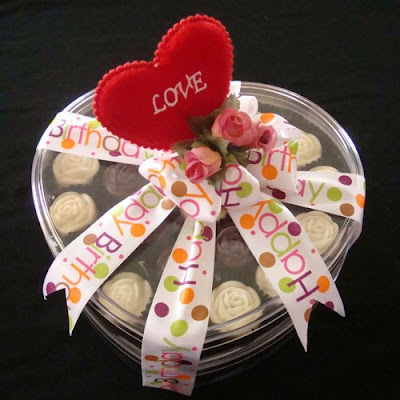 So, call us if u wanna gives ur loved ones a perfect birthday present within ur budget. Have fun!